Launch boards are a lot of fun! Kids of all ages enjoy them and they will use them over and over. We are including these in our fall fundraiser. Your purchase includes one launch board and a small bean bag. Don’t feel limited to only launching bean bags. 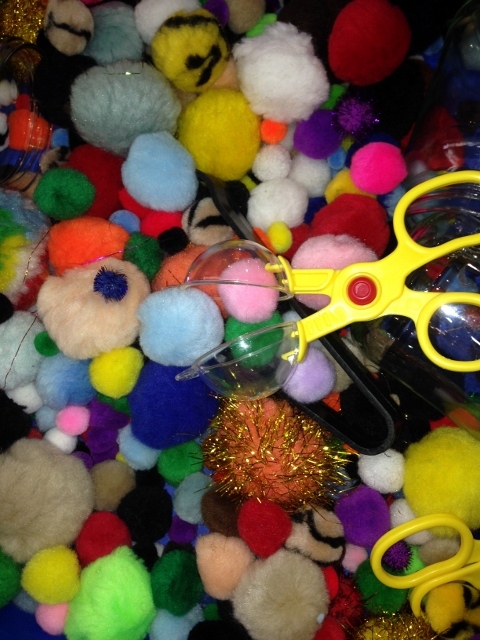 Balls of all types are fun. Scarves, stuffed animals . . . all offer a variety to the fun. Hmmm, I wonder what would happen if you launched a roll of crepe paper? Here is a short video showing two adorable guys playing with one. As you can see, even the little guys will do this over and over! Many of you generously donated toward our end of the year DVDs last year knowing that the funds we raised were going to the Nichols family to help with Jennie’s medical expenses. I am sad to say that Jennie died on June 20th. Jennie was 14 years old. 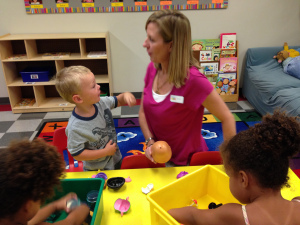 Jennie Nichols attended Aldersgate during her toddler and preschool years (as did her brother Graham.) Her mom, Kelly Nichols, was on our preschool board. The family also attended Aldersgate United Methodist Church. 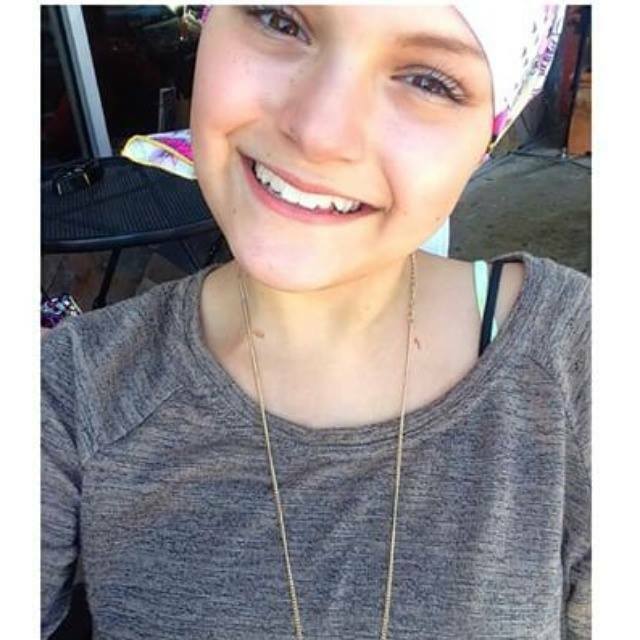 Jennie battled osteosarcoma for two years. For those of us that knew Jennie we were sure she would win the fight against one of the most deadly childhood cancers. She was that tough. She was that strong. Physical and emotional strength, however, was not enough to beat bone cancer this time. Many of us followed Jennie’s journey through her facebook page. One of the most poignant moments was when Jennie stated that she now understood a quote that hadn’t made sense to her before. And Jennie danced! She let us all join in her hard journey while making us laugh with her wit. She even named her IV pole and gave it a personality. Jennie is a true inspiration for me as I face different hardships. I wish I had her wit. I wish I had her determination. 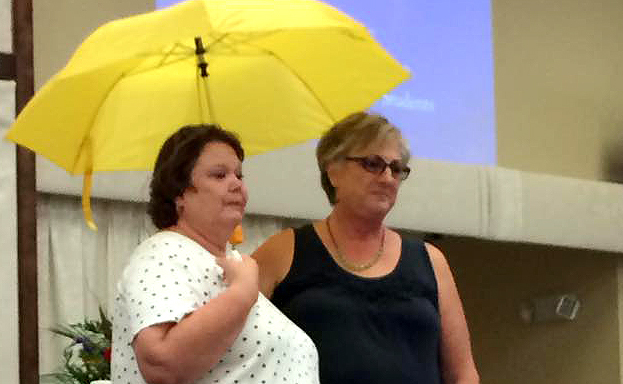 After Jennie’s death, Kelly received a gift of several yellow umbrellas with Jennie’s name surrounded by a heart printed on it. She gave some to us at preschool. We are putting them to good use. 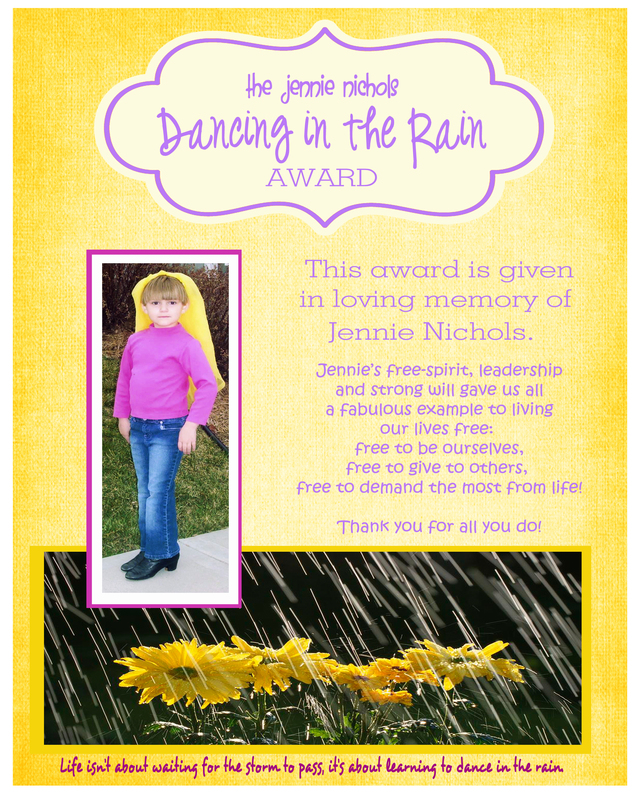 We have established the Jennie Nichols “Dancing in the Rain” award. Each year we will be honoring a staff member that most embodies this spirit. Here is the certificate they will receive. I was happy to present this award to Michelle Loe at our last staff meeting. As many of you know Michelle gives of herself so easily. She loves and welcomes everyone she meets. Michelle loves every child (and adult) unconditionally. Michelle is always the first person to reach out in support when one of our staff members has a burden in their own lives. A few years ago I personally received her loving care and attention as she cooked meals that would fit a specific diet I needed to follow in preparation for my thyroid cancer treatment. This is just one example of how Michelle reaches out. Michelle is also affectionately known as the “mom” of our staff. She does many of the drudgery jobs (shopping, dishes, laundry, etc.) 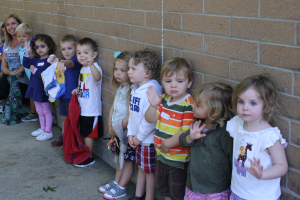 that help our preschool run without a hitch. She does all this with a smile! Michelle is a shining example of what this award represents. I know she doesn’t like the limelight but be sure to say something to Ms. Michelle next time you see her. She deserves this recognition along with the small gift of thanks that accompanied it. One final note about Jennie’s story. The Nichols were blessed to be able to pay all their medical bills and still have some additional funds left in their medical account. Recently they used the funds to make a payment toward the Zach Sobiech cancer research fund that supports research specifically for osteosarcoma. Their gift helped the fund reach their $1,000,000 goal. How cool is that! Here is a wonderful article about the payment reaching the goal and more about this effort. It is especially fitting that all this is happening this month. In case you didn’t already know, September is Childhood Cancer Awareness month. Welcome to a great year! What fun. 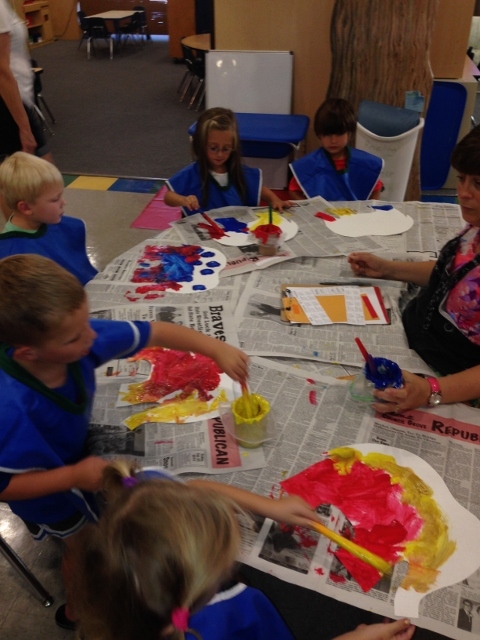 We are having a great second full week! As I walk through all the classes I’m already seeing so much interaction, learning, possibility . . . I snapped a few photos on my phone to share with you – can you believe all the cameras are in use in the classrooms as the teachers take photos to share with you throughout the year! Here is just a sampling of what I saw. As children learn to trust others outside their family circle, the build confidence in themselves. Trust is the foundation of all meaningful relationships. Also, through these positive experiences children learn to be more open to exploration and new experiences in the future. What? 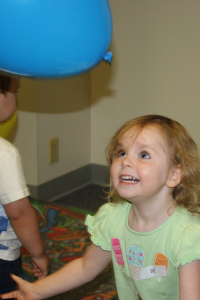 They play with balloons at school? That’s not learning??? Yes, actually, watching a balloon as it moves through the air is great eye-tracking practice and that’s important for reading. Also, experiences that encourage children to twist, stretch their necks up, turn upside down, jump, etc. all support the rapid vestibular input to their brain. Here’s a wonderful article about the importance of this. Imagination – the power to bring to mind things that aren’t here in the present. Creativity – applied imagination. The process of putting your imagination to work and having original ideas that have value. Innovation – putting original ideas into practice. This makes us realize how important it is to nurture the creativity in our children. I can’t say enough how important the exposure to books is for young children. It is by far the most significant support toward helping children grow into successful readers. Independent reading and being read to everyday are both incredibly valuable! How much more impactful is the number and measure of 30 gallons of water (which happens to be how much an elephant drinks in a day) when you are hauling, pouring, matching, watching . . . 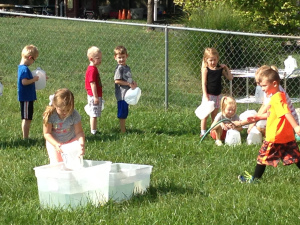 These experiences will be in these kids brains for future scaffolding once they are introduced to volume and other math terms and concepts. 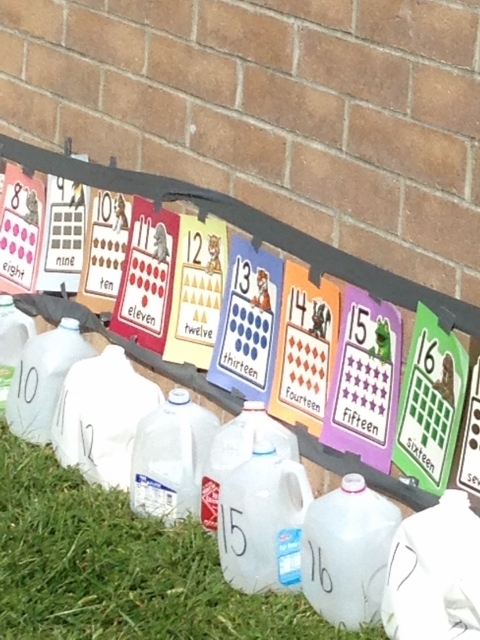 By the way, the kids also saw how much water they should drink in a day. It was much less than an elephant (1.5 liters) but still more than probably most get – isn’t that true for so many of us. 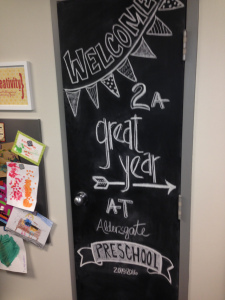 Yes, it really is going to be a GREAT YEAR at Aldersgate Preschool!